Frank Incropera acknowledges that it’s somewhat unusual for an engineer to delve deeply into the topic of climate change. Scientists, not engineers, have played the most prominent roles in the climate change debate to date. However, Incropera believes solving the problem going forward will require a joint effort from the two specialties. Scientists have provided an understanding of the problem, and engineers can now evaluate the feasibility of proposed solutions to the problem. 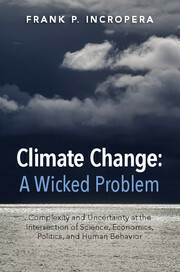 Incropera’s interest in climate change grew out of his interest in energy technology and the future of energy. 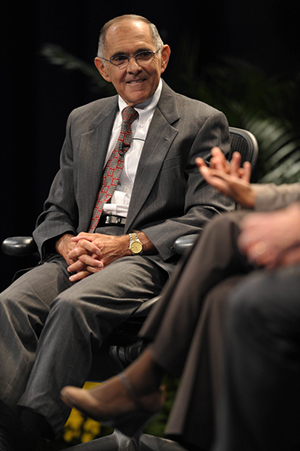 In the course of his research in those areas, Incropera, the H. Clifford and Evelyn A. Brosey Professor Emeritus of Aerospace and Mechanical Engineering and former Matthew H. McCloskey Dean of the University of Notre Dame’s College of Engineering, became convinced that the future of energy will be determined by global warming and climate change. He began devoting much of his time and energy to studying climate change, approaching the subject with no preconceived notions. After extensive research, he is convinced that the science is clear and that the problem is exclusively due to greenhouse gases. He also came away convinced that the proposed technological solutions alone won’t get us through the problem. “Let me begin by saying that technology is essential to dealing with the problem of climate change,” Incropera said. “And, it has many facets. Efficiency must be improved in every aspect of energy production and utilization. Decarbonization of transportation must occur through greater use of electric vehicles. Solar and wind energy must be aggressively implemented, with research and development continuing to increase system performance and reduce costs. Battery technologies must advance to facilitate growth in the use of electric vehicles, as well as solar and wind energy. The electric grid must be expanded to better accommodate intermittent sources of energy such as wind and solar, and it must be endowed with intelligence that can better control and respond to changes in production and demand. So while technology is essential to reducing greenhouse gas emissions and to mitigating the effects of climate change in a world that will have 9 billion inhabitants by 2050, with billions in developing nations aspiring to Western living standards, technology alone will not be enough, Incropera believes. It will have to be accompanied by behavioral changes for which moderation overrides self-indulgence. Eliminating some of the more frivolous, self-indulgent aspects of energy consumption will be a key to addressing the climate change dilemma, according to Incropera. Fresh off researching and writing the book, Incropera sees reasons for hope and reasons for caution in light of the new Paris accords. Originally published by William G. Gilroy at news.nd.edu on December 21, 2015.